KNF — Tirschwell & Co. Inc. Using unconventional sources, integration with multiple DMX vendors, and creative uses of inexpensive LED lighting circuit boards, we designed a lighting system heavily dependant on the architecture. Inside each ‘flying buttress’ are rows of led boards, each one color independent of one another. Above the boards, another row of color changing led boards illuminates the entire translucent buttress. Additional led color changing MR16 fixtures are located within each architectural niche, two aiming up and three down. Lastly, the back of each niche is illuminated with another set of LED boards. 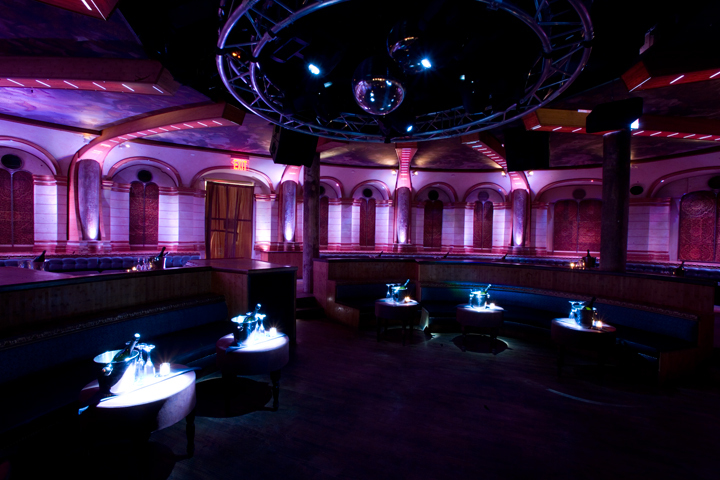 This gives the designer huge opportunities to make the architecture impact with the lighting on the dance floor. The concept was all about environmental saturation.